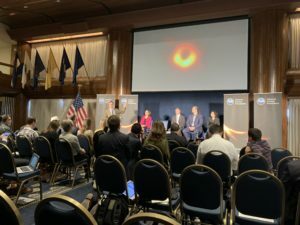 Washington, DC — Scientists unveiled the first-ever image captured of a black hole on April 10, a landmark achievement that was supported in part by a $7.2 million grant from the John Templeton Foundation. The image, which shows the light-ringed dark shadow of the black hole at the center of Messier 87 (M87), a massive galaxy in the Virgo star cluster, was captured using the Event Horizon Telescope (EHT), an array of seven observatories around the globe linked to create an earth-sized super-telescope. Templeton-funded scientist Sheperd Doeleman unveils the first-ever image of a black hole. Scientific discoveries on the physical and symbolic scale of the black hole images are years in the making. Doeleman said that planning for the EHT began a decade ago, and the project eventually involved over 200 scientists from 60 institutes in more than 20 countries. Harvard’s Black Hole Initiative, which launched in 2016 with $7.2 million in funding from the John Templeton Foundation, served as a command center for the EHT project. Theoretical astrophysicist Sera Markoff, who offered reflections on the broader implications of the black hole image, noted that it tells us a lot about what different black holes have in common and how they might differ. “General relativity does not change with different black hole masses, but the impact will change a lot,” Markoff said. Using the shadow image, the EHT team determined that M87’s mass is equivalent to 6.5 billion suns. That result resolves a longstanding controversy about the black hole’s mass and now allows indirect measures of the mass to be calibrated with the observed data. “This will lead to better mass determinations for other more distant black holes where we can’t actually see the shadow,” Markoff said. Learn more about the Event Horizon Telescope. Explore other questions relating to the study of black holes at Harvard University’s Black Hole Initiative. Watch Black Hole Hunters, a feature-length documentary about the observations behind the first black hole image. (Premiering Friday April 12 at 9pm ET/PT on the Smithsonian Channel).